A team where a sponsor’s logo would be on the shirt for at least two seasons. Additionally, logos can be on the after-match polo shirts and/or on track suits. A tournament which can include a “traveling” advertising fabric hoarding at the tournament – this is often a national tournament with occasional Sky TV coverage. Or how about a Pitch board? Example of an advertising board. 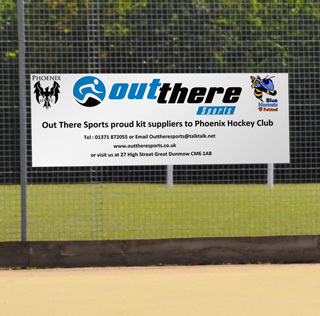 Advertising at The Four Releet sports ground. Our sand-based AstroTurf Pitch providesopportunities to advertise for local and regional firms and organisations that will reach sporting players, parents and visitors. Spectators will therefore be watching the game but also looking towards the advertising areas for possibly up to 70 minutes for a full game. Prices at £385 + VAT for 2 years. We would not usually allow more than one advertisement for a particular type of business. Additionally there can be advertising on our web-site. For more information or to enquire about sponsorship please complete the below form. Eg Estate Agent, Solicitor etc.